For so long I was needed a TV show manager and a episode tracker in one app and I was found some version but every one had something missing or the interface was so outdated. So the next best thing was to write a app that is what I need. This was the birth of TV Series Collector for android smartphones. If you wander what you can do with this app check next lines. First I was needed a source for TV shows data and the app is implementing the TMDb database API. Is something like IMDB and give the possibility to everyone to update information for movies, TV Shows and even to add new shows and episodes. 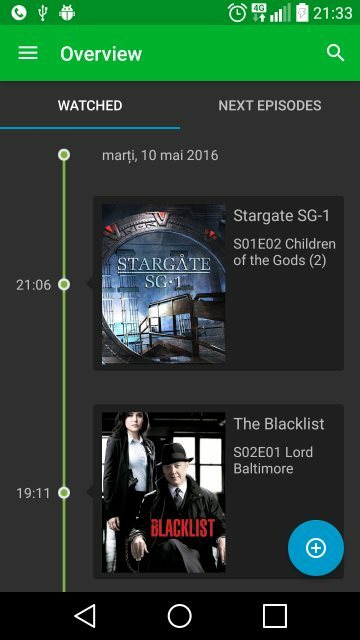 TV Series Collector app, group downloaded shows in watch list, each movie included in this playlist can be tracked, episode to episode. Also airing shows display next airing date for new episodes available. App implement a Google Drive export feature because every one of as change the device. One privacy feature is that you do not need to make a account to use the app, internet is required just when you add a new TV show, tracking episodes can be done offline. App is 0.99$, it will be added later a Light free version. If you want to try I can offer for the first 5 who comment this app a Promo Code. Also If you have a blog and want to write a article about this app I will provide a set of 5+1 Promo codes in order to offer them to your readers.